Only due to the lack of information flow, larger and beneficial industries are not being established in potential Rangpur region. 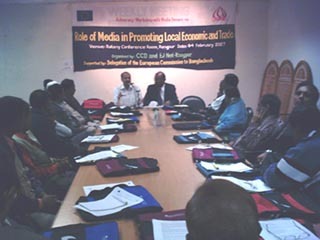 Mass media leaders said it while speaking in an Advocacy Workshop on Role of Media in promoting local economic and trade issues held at Rotary Conference Room in Rangpur today. With the support of European Union, mass communication oriented development organization CCD and EJ Net-Rangpur organized this workshop. Editors, Executive Editors, News Editors of the local and regional newspapers and Presidents and Secretaries of local press clubs and media associations of Gaibandha, Lalmonirhat, Kurhigram and Rangpur actively took part in the workshop. In the workshop, speakers said, it is possible to ensure free flow of information related to economic and business development issues through proper training and patronization. That is why, speakers stressed on increasing inter-relation of the business and media people for the local economic and trade development. Senior Faculty Member of Rajshahi Krishi Unnayan Bank A B Siddique moderated the dialogue and Assistant Professor of Mass Communication Department of Rajshahi University Moshihur Rahman was the key-discussant in the workshop. Member Secretary of EJ Net Rangpur Rafique Sarker and Project Coordinator of CCD A H M Abdul Hai presented welcome address while Convenor of EJ Net-Rangpur Wadood Ali was in the chair. Among others, President of Rangpur Press Club Sadrul Alam Dulu, President of Gaibandha Press Club Gobindo Lal Das, President of Lalmonirhat Press Club Kazi Sultan Ahmad, President of Kurhigram Press Club Robindronath Roy, President of Rangpur Reporter’s Unity Robiul Hossain Sarker, Executive Editor of the daily Juger Alo Sayad Abul Hasnat Lavlu, Executive Editor of the daily Akhira Nurunnahar Masud, Editor of the daily Lalmonirhat Barta S M Shofikul Islam Kanu, Editor of the daily Orjon Hasibur Rahman Sarker, Chief Editor of the Rangpur Barta Saiful Islam, Editor of the daily Chaoapaoa Fazle Elahi Swapan, Editor of the daily Paribesh A K M Fazlul Hoque, Editor of the daily Banglar Manush Liakat Ali and Training Officer of CCD Swaran Sarker took part in the discussion. Red details repots on dialogues hold on different following districts of northern region of Bangladesh.